I’ve been slowly trying out different recipes from the cookbook that I bought about half a year ago, Slow Cooker Revolution, by my most trusted source, America’s Test Kitchen. Everything I’ve tried so far has been amazing, and these peppers satisfied me in every aspect. 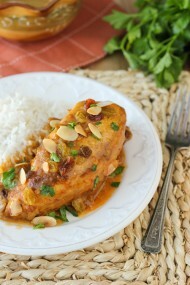 They are very flavorful and delicious, very juicy and also easy. I highly recommend getting this cookbook if you’re interested in more phenomenal slow cooker recipes. I love the fact that you can do your prep ahead of time, clean up, leave the kitchen and go about your business while slowly and gradually the aroma of a delicious dinner fills your kitchen. I made these peppers after working my night shift and before working another one, so you can be assured that it was simple to put together. My husband, Sergi, and brother, Valik (who lives with us now and works in the same hospital with me!) both heartily approved and were very excited to split the extra pepper. This is a keeper for our family and I’m sure I’ll be making it many times in the future. 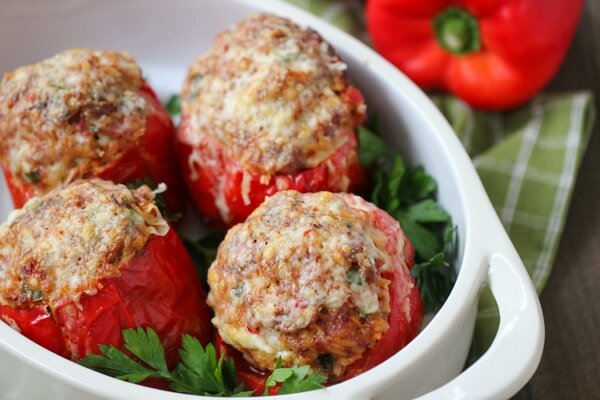 It’s very different from the stuffed peppers that we Russians usually make, but I really like it. I love the addition of zucchini, peppers and cheese to the filling. I served this with Homemade Marinara Sauce and it complemented the peppers perfectly. In a skillet, heat 1 Tablespoon of olive oil on medium heat. 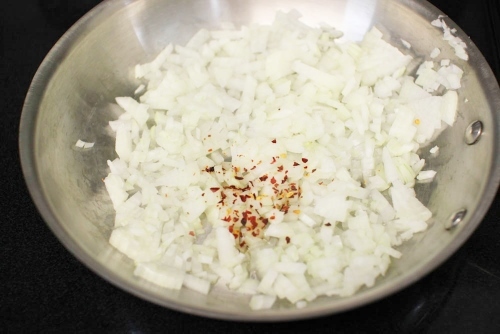 Add the chopped onion and crushed red pepper, season with salt. Cook for about 5 minutes, until the onions have softened. 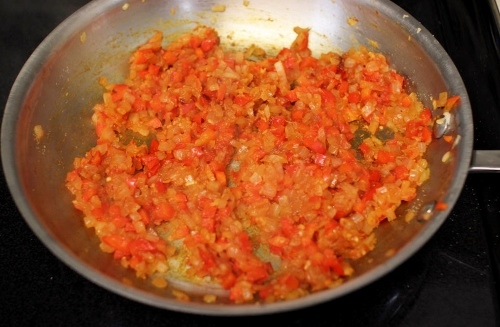 Add the garlic, tomato paste and the chopped pepper tops. Season with more salt. Cook for another 3 minutes or so. Cool slightly. Can you just add all these ingredients to the sausage meat without cooking it in the skillet first? Yes. 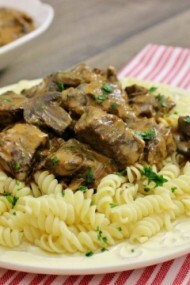 But the flavors won’t be as caramelized, flavorful and satisfying, but rather bland. Doing this one small extra step will ensure that your slow cooker food will have a depth of flavor, not boring and bland. America’s Test Kitchen instructs you to microwave the ingredients in this step, but I prefer to cook them on the stove. 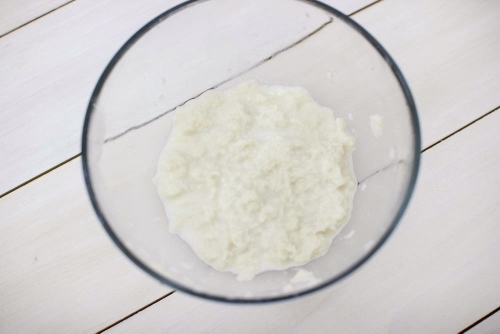 Pour the milk over the slice of bread and mash it finely with a fork. Add the rice, bread and milk mixture, cooled onion mixture, chopped zucchini, cheese and 1 teaspoon of salt and 1/2 teaspoon of pepper. Mix to combine. Fill the peppers with the meat mixture. 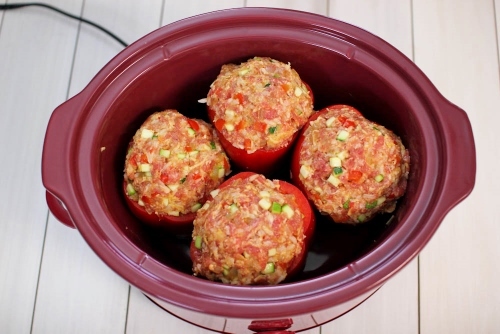 Place the peppers into the slow cooker. Pour about 1/3 cup of water into the bottom of the slow cooker. Cook on low heat for 4-6 hours. There will be a lot of excess liquid in the slow cooker. Just drain it off and discard. You can sprinkle more cheese on the tops of the peppers and broil them in the oven for a few minutes, until the cheese has melted and is golden. This is highly optional. I tried it both ways and both were superbly great. Garnish with shredded cheese and freshly minced herbs. I like to serve these peppers with a simple, homemade Marinara Sauce. You can also serve the peppers with a dollop of sour cream. 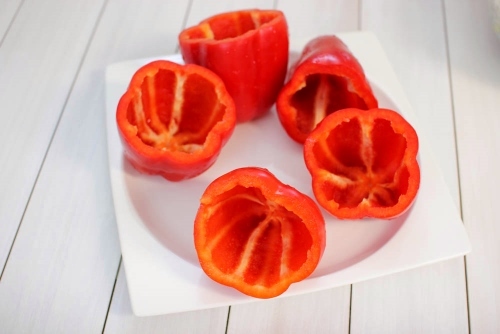 Place the peppers in a rimmed baking dish and pour in enough water to cover the bottom of the pan. Bake in a preheated 350 degrees Fahrenheit oven for about 1 – 1 1/2 hours until the meat is cooked through. Cut the tops off the peppers, take the seeds out and chop the tops . In a skillet, heat 1 Tablespoon of olive oil on medium heat. 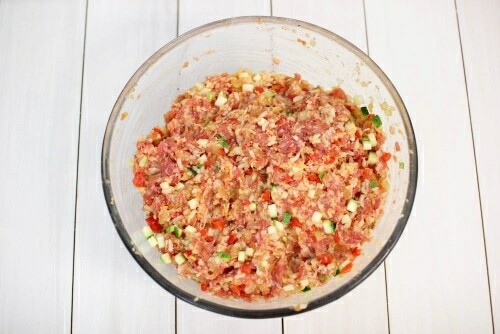 Add the chopped onion and crushed red peppers, season with salt. Cook for about 5 minutes, until the onions have softened. 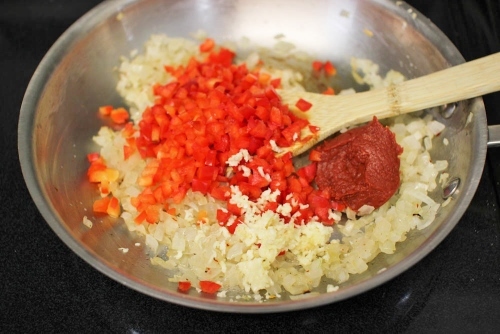 Add the garlic, tomato paste and the chopped pepper tops. Season with more salt. Cook for another 3 minutes or so. Cool slightly. 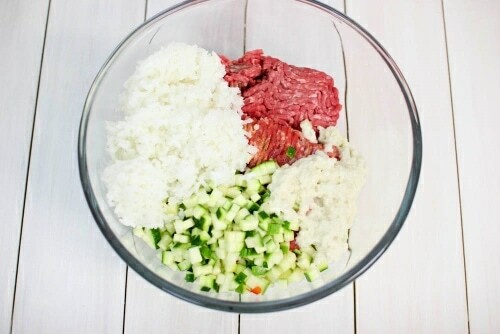 Add the rice, bread and milk mixture, cooled onion mixture, chopped zucchini, cheese and 1 teaspoon of salt and ½ teaspoon of pepper. Mix to combine. Fill the peppers with the meat mixture. 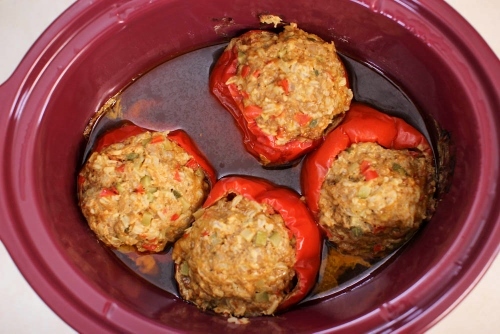 Place the peppers into the slow cooker. Pour about ⅓ cup of water into the bottom of the slow cooker. There will be a lot of excess liquid in the slow cooker. Just drain it off and discard. 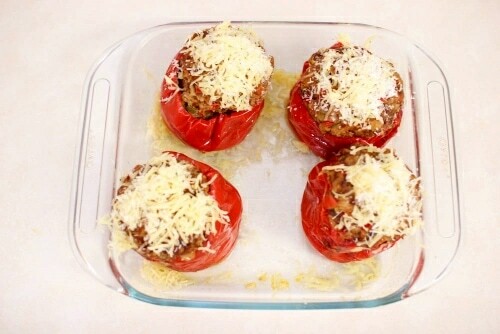 You can sprinkle more cheese on the tops of the peppers and broil them in the oven for a few minutes, until the cheese has melted and is golden. Garnish with shredded cheese and freshly minced herbs. I like to serve these peppers with a simple, homemade Marinara Sauce. You can also serve the peppers with a dollop of sour cream. Olga do you think these can be made in the oven?? Yana, I updated the instructions for the oven. 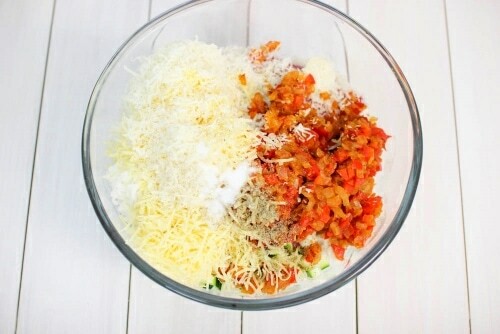 Just made a slightly easier version of this today (shredded my vegetables in the food processor instead of chopping them, used 1 cup of pre-shredded Kraft Italian Five Cheese Blend to replace both cheeses), to rave reviews from the whole house. I also made my life easier by making spaghetti sauce with meatballs for tomorrow and using some sauce to top the peppers today. I should let you know, however, that it never actually says when to mix in the sausage. I assume from the pictures that it is mixed in raw at the same time as everything else is mixed together? Also, I ended up with enough stuffing for six peppers. I think this is because the amounts of onion and zucchini are not accompanied by a weight, since my peppers were pretty big. Could you recommend a weight for those so I don’t use too much next time? Great recipe. 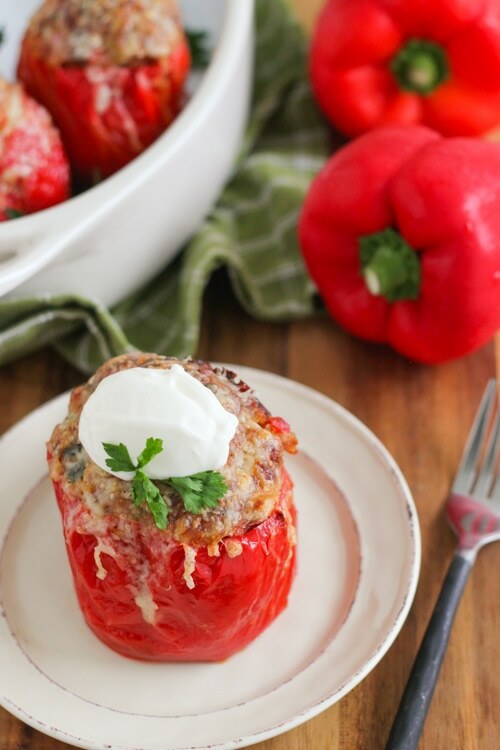 I’m interested now to see how “you Russians” make stuffed peppers, now that I have so much sour cream leftover. I made this recipe tonight with plans to cook it tomorrow. Will let you know how it comes out.